This hybrid is neater, more compact and retains its branching habit throughout the season, add to that early flowering with flowers that are lightly fragrant, open all day and are upright rather than drooping and you have a great improvement on standard varieties. 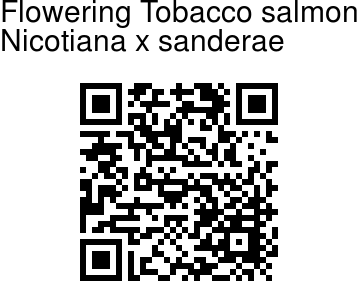 Flowering Tobacco is the ornamental cousin of the commercial tobacco. This great bedding plant will grow fantastically in places with hot, humid summers. 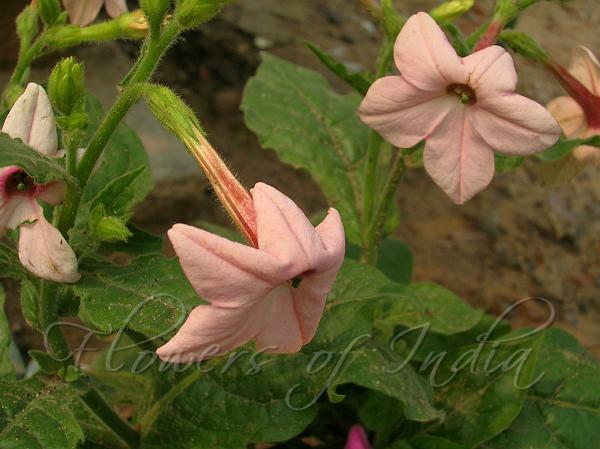 It is bright and long blooming, with tubular flowers that flare into bright stars. Old-fashioned types close for part of the day and open toward evening with a strong, sweet smell. Available in green, white, purple, red, cream, citron yellow, deep rose, smoky tones and whites. White varieties are especially attractive at night. Foliage is large, somewhat coarse and sticky, and resembles commercial tobacco, to which it is related. New plants may be started easily from seed sown directly into the garden or as transplants. Cuttings will also root, but are rarely used since the seed grows so readily. All species of this genus are thought to contain narcotic poisons.